You can’t argue that the biker jacket is on trend right now! 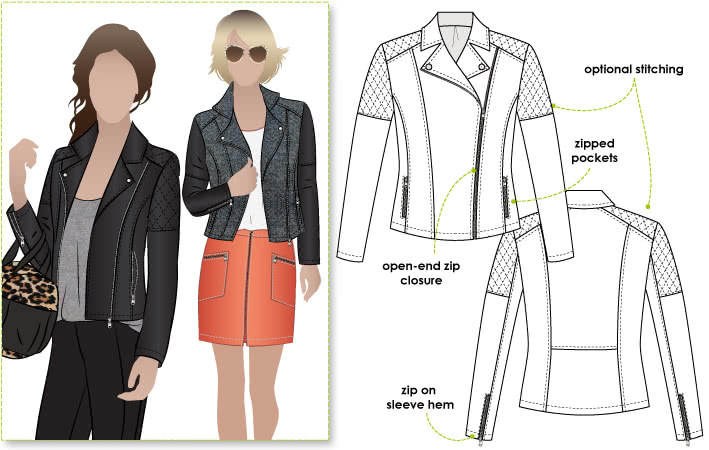 We’ve had lots of requests from our customers for biker jacket sewing patterns over the last month, so the style was definitely in our minds. When one of our girls was in Paris recently, and saw almost everyone wearing a biker jacket, we knew we had to include one in the Style Arc range. While there were plenty of leather examples, the biker jackets on the streets of Paris also featured fabulous brocades and a mixture of textures. That gave us the idea to incorporate a shoulder yoke, separate sleeve head and lots of design lines. Quilting was a major influence also – you can see the optional stitching design features. We’ve designed the Ziggi to suit all ages and it’s great for trans-seasonal wearing. All the girls at Style Arc want one! We might have to make more than just one sample! We wanted to come up with a skirt that would work with the Ziggi Biker Jacket, but that still had a basic shape to suit everyone. This was difficult! We love the zip treatment that ties back to the Ziggi Biker Jacket. 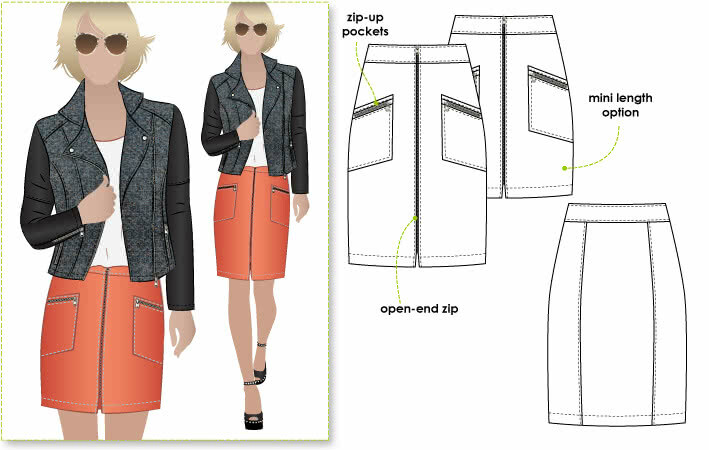 The zips on the pockets and centre front are a point of difference and give the Mindi Skirt a bit of a rock look. Where possible we try to make our sewing patterns versatile. The Mindi is no exception, it can be made in two lengths and you can always leave out the optional zip pockets. Construct it to fit your own personal style! We send free sewing patterns with every order! We change the freebie every month. 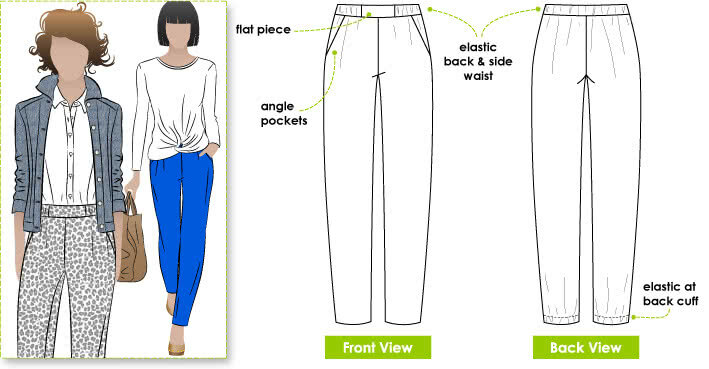 The Lola Pant is our free sewing pattern for November 2013 – you get it free with every order until the end of November 2013. Remember to let us know what size you’d like by leaving a message in the comments box with your order – otherwise we have to guess! We all felt we wanted an easy fit pull-on pant with a narrow leg in a woven fabric and this is what we came up with. The centre front waistband panel eliminates the bulk of a regular elastic waist pull-on pant, and the soft drape through to a narrow leg opening is a feature of many up-to-the-minute RTW designs. Style with comfort! So there you have it, our new sewing patterns for Sewvember! 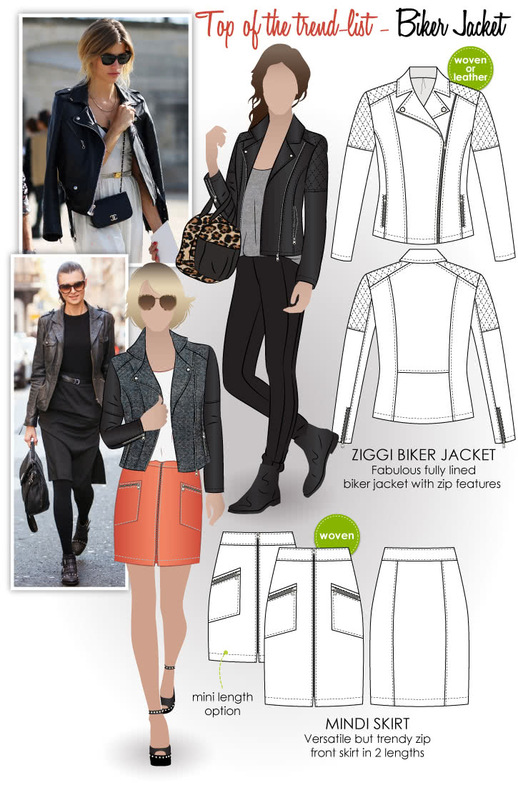 We can’t wait to see photos of you in your Ziggi Biker Jacket and Mindi Skirt! Bonus points if you can incorporate a REAL motorbike! Oh… and don’t forget to sign-up for our newsletter by submitting the form just below!